OSBORN, ELIZABETH (Myrick; Paine; Doane), midwife; b. 1715 probably at Sandwich, Massachusetts, to Samuel Osborn and Jedidah Smith; d. 24 May 1798 at Barrington, Nova Scotia. Elizabeth Osborn probably was educated at local schools in Eastham (Mass.) and by her father, a schoolmaster and Congregational minister there. “A young lady possessing superior ability, beauty and character,” she married Captain William Myrick at Eastham on 23 Jan. 1733/34. They were residing in Boston when he was lost at sea in 1742. Elizabeth became administrator of his estate and was allowed money for house rent and maintenance of herself and the children. On 14 Jan. 1744/45 she married 50-year-old William Paine, an Eastham merchant and provincial assemblyman. He served in the 1745 expedition against Louisbourg, Île Royale (Cape Breton Island) and died there in the summer of 1746, leaving her with a son William. Elizabeth had previously been courted unsuccessfully by a childhood friend, Edmund Doane. Now a 34-year-old widow with four children, she said she believed the fates had decreed that she should marry Edmund, and she did so on 10 Nov. 1749. After some years Doane decided to join the emigration of Cape Cod fishermen to the Cape Sable area of Nova Scotia, which was nearer to productive fishing grounds and where free land grants could be obtained because of the deportation of the Acadians [see Charles Lawrence*]. In 1761 Doane had his house dismantled and the frame and boards loaded on a hired vessel together with furniture, grain and vegetables, and some animals. Young William Paine was left behind to continue his education, and Elizabeth with her seven children by Doane set out for Nova Scotia. A gale blew the ship ashore; the Doanes had to salvage what they could and embark in another vessel. An autumn storm drove their ship past Barrington to Liverpool, where they had to spend the winter in a rough storehouse. In the spring of 1762 they sailed to The Passage (Barrington Passage, N.S. ), and in the frame house they built near the harbour they opened a shop, selling such goods as flour, corn, salt, molasses, rum, sugar, cloth, nails, and shoes to about 50 customers. 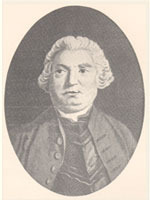 They obtained their supplies from Elizabeth’s brother-in-law, John Homer, a Boston merchant and shipowner. But the inhabitants of Barrington suffered many hardships in the early years and had little cash. Thinking of returning to Cape Cod, Edmund sold his property. Elizabeth, however, had filled an important niche in the scattered fishing settlement. There was no physician, and being skilled in the use of roots and herbs and in nursing she was soon acting as nurse, doctor, and midwife. At the request of those relying on her services, in 1770 she took the unusual step of applying to the proprietors of Barrington for “Land to Set a house upon.” Her petition was endorsed by 38 male proprietors, “She Being a . . . Expert midwife as its Said By the Woemen . . . and . . . Incomparably well Skild in fisick and Surgery.” She was granted 1 1/2 acres, and the Doanes remained in Nova Scotia. She was still practising her craft in her 70s and 80s, and when she was needed at a distance men would come to carry her over hard places in a basket. This pioneer woman is honoured by a marker on her grave in Barrington, not for her services to medicine, but because she was the grandmother of John Howard Payne, lyricist of Home, sweet home. Barrington Municipal Clerk’s Office (Barrington, N.S. ), Barrington Township records, The proprietors book of records of their divisions and measurements of their lands and meadows, 1768–1803, pp.76–77; A record of births & deaths pr. Samuel O. Doane. Edwin Crowell, A history of Barrington Township and vicinity . . . 1604–1870 (Yarmouth, N.S., ; repr. Belleville, Ont., 1973). The Doane family . . . and their descendants . . . , comp. A. A. Doane (2nd ed., [Trenton, N.J.], 1960). Phyllis R. Blakeley, “OSBORN, ELIZABETH,” in Dictionary of Canadian Biography, vol. 4, University of Toronto/Université Laval, 2003–, accessed April 22, 2019, http://www.biographi.ca/en/bio/osborn_elizabeth_4E.html.